Ali is more-or-less the star witness of the case for a loyalist massacre in Al-Houla. Widely publicized and adorable, he also made clear the nature of the horror racking Syria in a way consistent with previous Western thought. "There is an alleged survivor, a young boy, and the CoI was able to interview him via skype. The CoI also considered video evidence posted by anti-Government groups of the boy being interviewed by others. In both interviews he blamed the killings on Shabbiha and soldiers of the Syrian army. In one interview the survivor stated that the perpetrators arrived together in tanks. The CoI took note of the age of the boy and duly considered his suggestibility." The following analysis, or rather the earliest core portion of it, has been summed up more readably in this external article published at Syria News July 4. The following, however, contains many details and more recent findings not reflected there. Young Ali has spoken to the world of his alleged ordeal through phone/skype communications, apparently starting on May 28. There is one main video interview with numerous postings, apparently done remotely by a video connection, conducted by an un-named man. He also spoke to Martin Chulov of the UK Guardian via Skype, first un-named but with plenty of detail, then named amongst other witnesses and activists explaining their version of the massacre. Both of those occurred on or before the 28th, but he also spoke to the Associated Press the same way on the 30th. In the french-speaking media, he was interviewed as well and seems to have build some kind of stardom, and attraction of motherly journalists who love him for his apparent courage. Ali reportedly had no surviving family and, as Chulov noted, was living with “a town elder who is a member of the Syrian Revolutionary Council and is now caring for him,” as well as arranging the discussion. 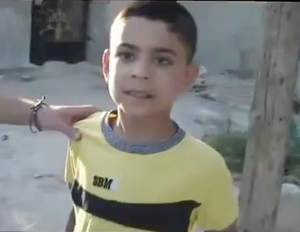 The AP contacted him "through anti-regime activists in Houla who arranged for an interview with the child over Skype." If we consider him impressionable, it's quite clear who would be doing the impressing and what basic form it would take. The details of his accounts will be considered below, subject-by-subject. The following just goes from what Ali says. The real family he claims to be part of, and how his recall meshes with it, are covered below. In the activist video, Ali gives his killed father as Ali Alsayed (0:37) and to Chulov as either Aref or Shawki: "They said they wanted Aref and Shawki, my father and my brother," sounding like Aref is the father. They also asked after "my uncle, Abu Haidar." There he cites six murders in his household; "my father and uncle," "Aref, my oldest brother," his mother, and younger siblings Nader and Rasha. He happened to see the same soldiers afterwards (see below) and "they were describing six people dead in my house. They included me. They thought I was dead." By this, he thinks only five were killed. In the video interview, he names a brother Shaoqi (Shawki), his father Ali, and two uncles: Oqba, and Aref, unclear who was arrested as opposed to killed. Only one other sibling can fit to give us five, but in general he's cited three younger siblings being killed (for a minimum death toll of seven): Nader was 6 (shot in the back and the head, named to Chulov and the AP, and specified by injury in the video). His sister Rasha was 5 (mentioned to Chulov and the AP), and brother Aden was 8 (mentioned to the AP). Only the total younger siblings cited on video - three - matches with his one specified death toll to Chulov. The one known witness list (from the Damascus Center for Human Rights Study), comprehended with Google translate, doesn't clearly contain any names Al-Sayed (السيد). There is a family name Arif or Aref (عارف), the first name of Ali's father/uncle/brother, for entries 30, 31, 48, and 93. Family matches include Nader (#30) and Rasha (#48), a younger brother and sister cited by Ali. Tthe other two Arifs given as dying are Mohammed and Adel. The name Adel is of further interest. To the AP, Ali cited a brother Aden (Adel? ), aged 8, who was also killed. Anti-government activist Maysara al-Hilawi described to Reuters a single survivor of the Al-Sayed family: "A baby, Ali Adel al-Sayyed, miraculously survived." 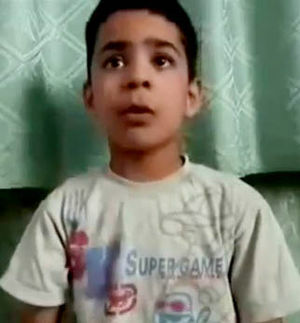 Der Spiegel spoke to Ali as well, in July, and reported his name as Ali Adil Al-Sayed, still aged 11. The DCHRS victim list also contains one "Mr. Adel Shawki," perhaps meaning "Mr. Aref Shawki," meaning the brother/father Shawki that Ali cited. Thus it seems possible the related entries were gatheredfrom Ali himself,who managed to confuse things again to create the mess recorded here. In the video, Ali says eleven soldiers entered his home after emerging from "the tank." To Chulov, he said “they came in armoured vehicles and there were some tanks.” To the AP, he said they arrived "in a military armored vehicle and a bus." In general, he describes them as primarily military in appearance, with some in uniforms and some in civilian clothes. In general, Ali claims he escaped only after the attackers left, having played dead until that point. They had found him and shot right at him, he's said, but managed to miss, and then he dramatically smeared himself with someone else's blood as a disguise. Some sources say it was his mother’s blood he used, but no primary sources seem to support that. Martin Chulov reported in the Guardian “he smeared himself in the blood of his slain brother," apparently Nader, having mentioned his shooting as seeing his spirit leave his body just before this. To the AP, he specified it was Nader's blood he hid beneath. However, in the video interview, he doesn't mention smearing himself with blood at all. He says that when they shot and missed, he was actually "hit," or grazed on the back of his right hand. He shows this to the camera, which can make out what seems like three faint scratches, less than three days after the massacre. It seems it was his own bloodied hand that he used; "after they killed us, I went like this (right hand covering the side of his face), acting like I was shot." The stricken home little Ali seems to describe is, by all indicators, one of those known about and most widely seen. Opposition videos do not show it, except by borrowing others' footage. This is consistent with their claim of not being in control of that part of Taldou. The Syrian state broadcaster SANA had its news crews filming the scene, with the bodies in situ, as at a crime scene, the following morning (May 26). They blamed armed terrorists, and named the family as that of Aref Mohammad al-Sayyid, killed alongside "his two brothers Imad and Ouqba, his wife Izdihar Ali al-Daher and three children." Aref is a common name in Ali's narratives, as we have seen alternately used for his father, his uncle, and his older brother, who were, he said in most versions, taken outside and shot. And as a clincher, uncle Oqba is there, while the third man is in contention: Ali cites his older brother Aref/Shaoqi, while SANA said it was his alleged uncle Imad. The UN monitors were taken there and made notes and took video. The few Western media units allowed in were able to see and film there. (details forthcoming). Of course SANA filmed the home. Their collective views make it clear this is the location. The image above, from UNSMIS video, is of the spot where three men were executed just outside the door (seen here after one was removed). In Ali's versions, that's his brother, father, and uncle. Inside are shown two young boys shot in the head (see inset), and a young girl, Rasha, with no obvious injuries or visible blood, but clearly dead. This corresponds to Nader, Aden, and Rasha. His unnamed alleged mother was also seen. The UNSMIS monitors filmed the bloodied but clothed body of (Izdihar?) laying on a bed. still, graphic This allows a clear match with the bed and pillows shown in a France 2 documentary, along with subtitles suggesting she was raped by her attackers, a detail Ali didn't mention. still]. Note also in the UNSMIS still the darkness of her eyes, especially the right one. It's not at all certain, but they might be gouged out. As the monitors filmed on the 26th, they also mediated the body removal, by the opposition, from the government's jurisdiction. The authorities allowed this and the victims were taken away - by what the government considered the killers or their allies - and presumably buried with the others in the mass grave they operated in the north of town. The wishes of the surviving family seem not to have mattered; as we have seen, Ali was sent to live with activists, having no surviving family. No name was specified for that memorable protester dad, to let use see what Ali thought it should be in July. We haven't yet seen any UN Monitor "assumptions," or even mentions, of the possibility Aref or whoever was targeted for his government loyalty (or even the corollary of that, that he was targeted or even killed by the opposition). Such evidence would be quite interesting to see, if it exists. As mentioned in the introduction, the UNHRC's commission of inquiry (CoI) at first made note mostly of Ali's age and impressionability. But according to the CoI's final report (August 15, 2012), that problem remained only potential, not leading to any actual inaccuracies or distortions they could detect. They decided that the accounts of children, in particular, “remained consistent ... despite the fact that they were conducted over an extended period of time” and with “different investigators.”  This clearly refers, in part if not primarily, to Ali. And as we can see, remaining consistent from source to source is not his strong suit. Ali was featured centrallly in a hard-hitting France 2 documentary, Houla, autopsie d’un massacre aired September 20, 2012. He spoke via skype/internet to a Syrian opposition activist (shown) and the program. He can be seen biting his lip apprehensively most of the time, but smiling at other points (as seen at left). The motherly activist seems, from her sentimental smiles and excesses of thoughtful nodding, to believe and admire Ali more than anyone else she'd ever met in her life. The French dubbing doesn't help us understand what he says here, but the program apparently blamed the Syrian government like Ali does. France 2 showed what they said was his home. It's placeable on the map, and appears to have been attacked, but it isn't the one Aref Al-Sayed and his family lived in. They seem to start the video near city center, up here and cross the fields south, following Main Street, but behind the houses on the east side of it. The edit at 2:01 is as they approach this row of buildings, and after the cut they're just on the other side of them, looking west down an alley. where they turn west. In that alley they pause, with Ali now in the rear with his guardian, the cameraman, and Suleiman (the still at right is from here). They get almost to the sidewalk on Main street, then turn left and start going though holes in walls, into and through vacated houses in this ghost town. The first is two houses north from the one France 2 showed - they pass through that one without pause. They again cross the fields behind buildings, at 5:45 passing here - even with the arches near the crime scenes. The home they finally arrive at (9:45) is the one discussed above, Aref Al-Sayed's now-famous violated home, confirming that it's crime scene that Ali's questionable accounts are attached to. There will be further notes on this video forthcoming. Why Ali Adel? The early analysis here was confused about family names. Al-Sayed was auto-translated to Mr., which it basically means. All the right victims appear, Aref's children with Aref as a middle name - Rasha Aref, Nader Aref, Adel Aref. Ali should be the same, but instead he says his name is Ali Adel Al-Sayed. The lists clearly include his sometime brother Shaoqi Adel Al-Sayed. Both names suggest they're sons of an Adel Al-Sayed, and the 2014 victims list says Shaouqi was in fact the son of Adel Mohammed Al-Sayed. The Mohammed part suggests Adel would be a brother to Aref Mohammed and Oqba Mohammed, making Shaoqi Adel a nephew to Aref. (SANA had said the three dead men were brothers, and the third was Imad, not Adel) So what was Ali? By name, a nephew. By account, sometime son, sometimes nephew. Only Survivor out of How Many? How many children did Aref and Feirouz/Izdihar have? The state media sources said only they died with three children; there may have been more. The VDC says Aref is married with 4 children. They give Fairouz the same note. Somehow they list an adult Khawla Aref Al-Sayed, age 32 - the same age given for Aref when an age is given. Skipping that confused entry, we have Rasha, Adel, and Nader clearly listed. The 4th child would be Ali, so long as there's no brother Shaoqi like he sometimes says. Oops - the VDC lists Shawqi Adel Al-Sayed as adult male, age 23, and having Mother's Name: Fayruz. Like Ali says, that's his big brother, sharing the wrong middle name for a son of Aref. And in this case, he has a drastically wrong age. He would be born when his mother was 17 and his father nine years old. This is biologically possible but clearly not likely. The VDC, obviously, was just wrong to trust Ali that this guy was his brother. What else is it wrong to trust Ali about? Also, the 2014 list says Nader was 5 and Adel 10 - to Ali Adel's alleged 11, apparent 8-9. That would be some close birthing. It's entirely possible, but by this and other measures Ali does seem sort of jammed in there. In fact, almost in the wrong order, appearing younger than 10. (but then, both boys seen dead on video appear younger than 10 as well). Against that option: SANA gave Aref Mohamed al-Sayed as the slain man's name. Her prior husband would be Adel Mohamed Al-Sayed. Odds are slim that the same woman would marry two men with the same last and middle names and such similar first names. Some kind of disagreement that's still hard to decode is at work. It is interesting that this same confusion seems to encroach on the name of the star witness Ali. 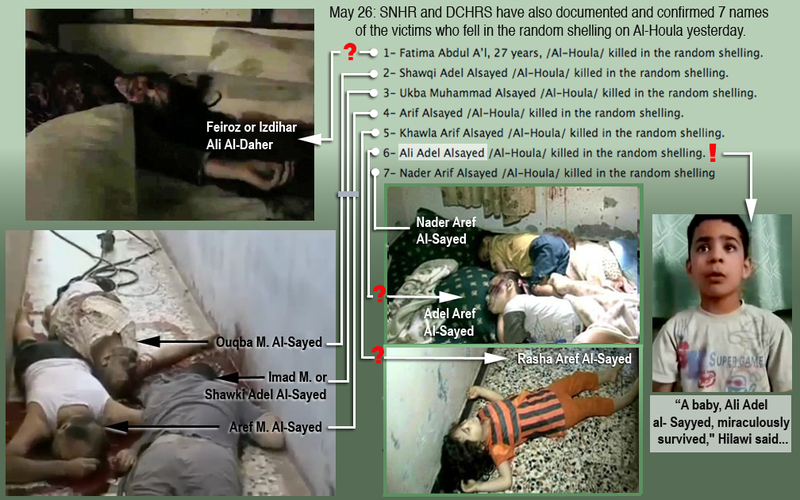 Phantom Ali Adels: The following graphic seeks to show how oddly this early list (on Facebook) of exactly 7 "verified" victims of "random shelling" line up as a different version of the seven victims at Aref's house. Of special note here is the presence of an Ali Adel, implicitly among the three children - only one of which was named here as they later would be. How did this report come to be? The implied mother here is Fatima Abdulaal, age 18 by the new 2014 list. A very early reported death by VDC entry #17031 - amongst the rebel fighters and lots of blank (deleted) entries. The two stray child entries here wound up in the VDC as adult people. How and why is unclear. Khawla Aref (#17234, age 32, listed right after Zainab Arouq, a real but often missed victims, so possibly a real person with a confused entry). Ali Adel adult, age not given (#17159 - 4 entries after mother Fairouz, amongst some blank entries). This page was last edited on 1 June 2018, at 12:14.